Twenty-four Boer x Spanish does (3 yr of age, having kidded once previously and with an initial BW of 42.7 ñ 1.2 kg) were used to determine the efficiency of ME utilization for pregnancy (kpreg). Six does were nonpregnant and, based on ultrasound determination on day 45 of gestation, six had a litter size (LS) of 1, 2, and 3. However, only 10 of the pregnant does delivered the expected number of kids (three, four, and three with LS of 1, 2, and 3, respectively). Does were fed a diet of approximately 50% concentrate in accordance with assumed maintenance plus pregnancy energy requirements based on estimated nonpregnancy tissue BW and LS. Recovered energy (RE) was determined by subtraction of energy expenditure (EE; respiration calorimetry) near day 80, 100, 120, and 140 of gestation from ME intake (MEI). RE was assumed attributable to pregnancy tissues (fetus, fetal fluids and membranes, uterus, and mammary gland), and ME used for pregnancy (MEpreg) was estimated by subtracting MEm determined with nonpregnant goats from MEI by those pregnant. For does with actual LS equal to that expected, the no-intercept equation for the regression of RE against MEpreg was: RE = MEpreg x 0.252 (SE = 0.030; R2 = 0.64), indicating a kpreg of 25%. Although, a regression including LS (1 vs. 2 or 3) suggested greater kpreg for LS of 1 (40.2% ñ 5.6) vs. 2 or 3 (20.5% ñ 3.2). 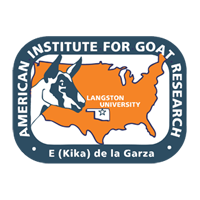 Regressions for goats with LS different from expected suggested positive effects of use of energy mobilized from nonpregnancy tissues on kpreg and of use of dietary ME for energy accretion in nonpregnancy tissues on the efficiency of whole body ME utilization. In conclusion, the average efficiency of ME use for pregnancy regardless of LS in goats was near 25%, which when considering the expected proportion of all pregnancy tissues attributable to fetal or conceptus tissues implies an energy requirement for pregnancy of goats similar to common recommendations for sheep and cattle.